It's been a busy couple weeks for me, and then this weekend haven't been feeling well. Earlier last week I had a few days where I kept to myself trying to figure some things out and I wasn't the only one. I had conversations with others who were facing their own obstacles, including many who are dealing with negative people and situations in their lives. I've blogged about it before, the importance of surrounding yourself with those who will lift you up and not bring you down. While doing some meditation the other day I thought of one particular person's situation dealing with not only a negative person, but someone who is constantly mentally and emotionally hurting her and she deserves better and so much more in life, we all do. I'm not saying it's easy to face these people or these situations, but when it comes down to it only you can make the decision to stand up for yourself and remove yourself from the negativity that's holding you back from being the best YOU that you can be. I heard a quote today that I thought was a great reminder to not let what others say and do effect you in a negative way. 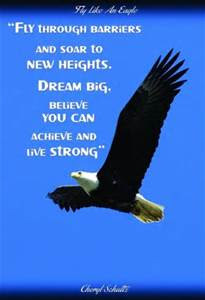 "Be like an eagle and soar above the mockingbird." We all have goals and eventually we will encounter obstacles. We can either soar like an eagle to new heights and push through the obstacles and conquer our goals; or we can just stay where we are, in our comfort zone, and never know how great we can be!